This shop about this Slam Dunk Snack Mix Recipe has been compensated by Collective Bias, Inc. and its advertiser. In order to celebrate the end our my son’s basketball season, I thought I would make a fun Snack Mix to share at their trophy party. While I have made the traditional snack mix with cereal many times before, I just could not resist trying something with the new Cheez-It Crunch’d and Grooves I noticed at our store recently. 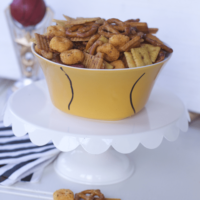 I have used Cheez-Its in my other snack mix but there was something about the great orange colors and vibrant flavors that kept pulling me in their direction for this recipe. Plus I love the shape of the Cheez-It Crunch’d they look like a little basketball game. 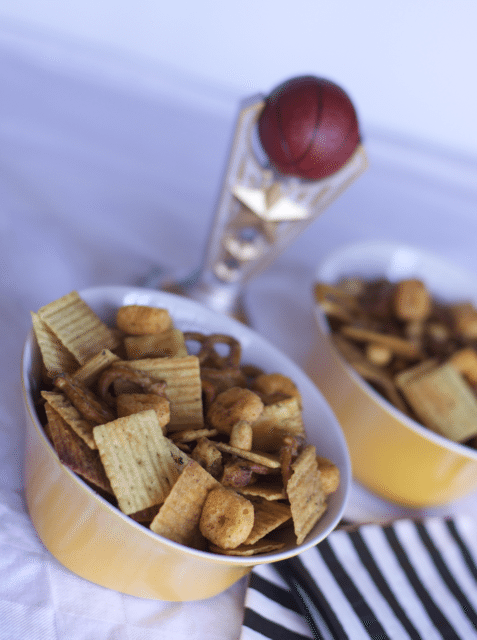 So whether its a end of season Basketball party or just watching your favorite Basketball Team on TV, you need to make a double recipe of this very flavorful SLAM DUNK SNACK MIX. Some snack mix recipes use so many different spices it starts to be expensive. 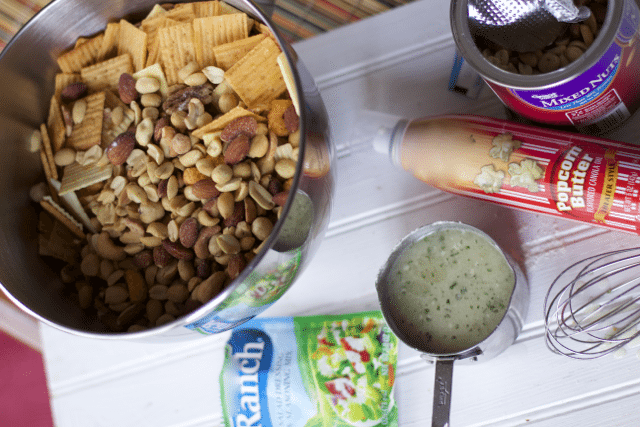 No worries with this Slam Dunk Snack Mix Recipe, you just mix a cup of oil with a packet of your favorite Ranch Dressing mix and that is it. The original recipe called for butter flavored popcorn oil, I could not find it at my store, but I did find a spray bottle with the same flavor. Ready for the hard part… Please I am not asking you to shoot a 3 pointer: Just mix the ingredients so they are all coated well with the seasoning mix but you don’t want to crush the crackers. Lay it on a cookie sheet and bake, just turning every 15 minutes. In a few photos we also used a dry erase pen to decorate some orange bowls I had on hand to replicate a basketball. You are going to want to put out a big bowl of this stuff. Sorry for the multiple pictures, I could not decide which photo I liked best. Never heard of Cheez-It Crunch’d before? I did not either until I saw them at Walmart, but not in the cracker Aisle. I found them in the chip aisle at the very bottom. Plus, it’s a completely new product; Crunch’d is Cheez-It’s first-ever crunchy puff made with 100% real cheese. 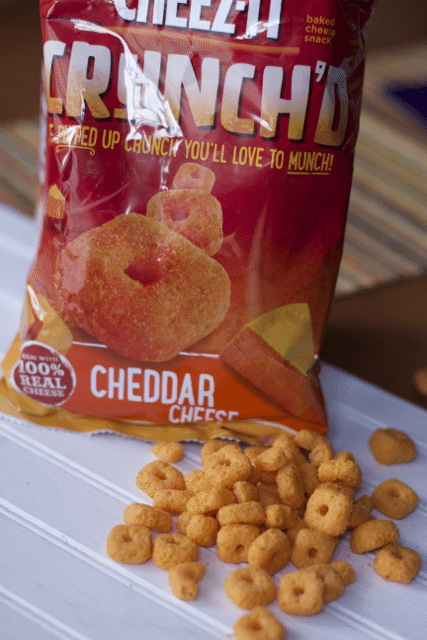 Puffed-Up Crunch with Real Cheese. A flavor I have never tasted before. It comes in both Cheddar Cheese and Hot and Spicy. Because there were kids involved, I went with Cheddar Cheese. 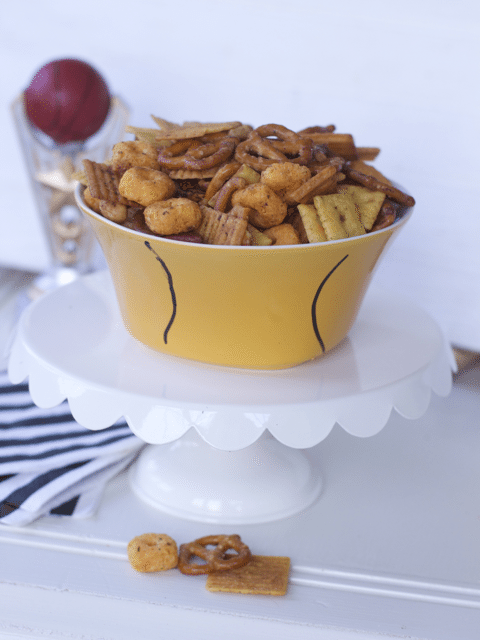 I chose the Cheez-It Grooves as well for this Snack Mix Recipe because of all the fun flavors and because they are flat almost like a chip and could be easily dipped into your favorite game day dip. 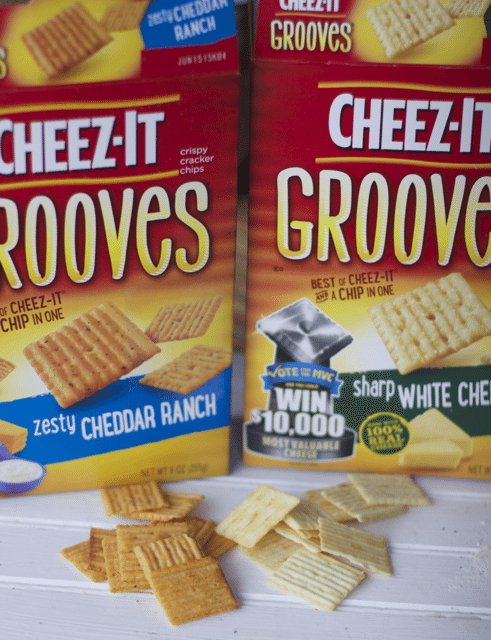 You can find such complimentary flavors such as Zesty Cheddar Ranch, Original Cheddar, and Sharp White Cheddar. I found all the ingredients necessary at my Walmart Store. 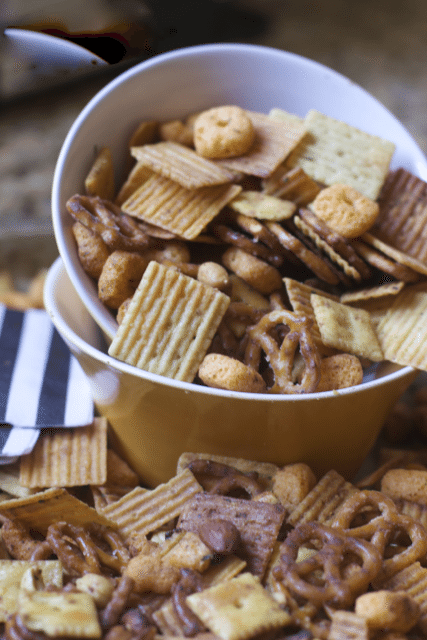 The perfect combo of your favorite salty snacks in one snack mix. 1. 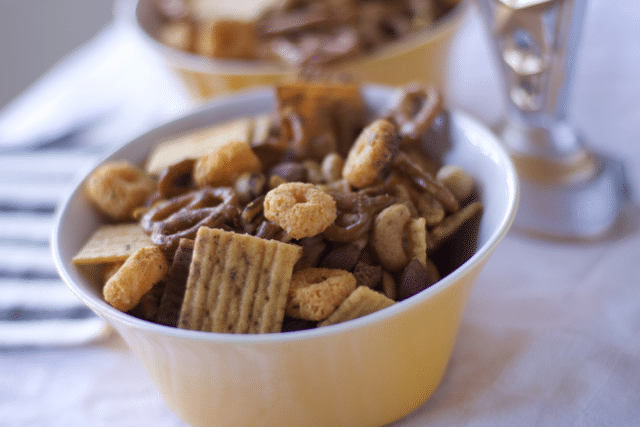 In a very large bowl, combine all the crackers, pretzels and nuts. In a small bowl, combine oil and salad dressing mix. Pour over cracker mixture; toss to coat evenly. 2. Transfer to an ungreased 15-in. x 10-in. x 1-in. baking pan or spread them among 2 pans. 3. Spray the mixture with the butter flavored spray and coat generously. Stir one more time. Bake at 250° for 45 minutes, stirring every 15 minutes. Feel free to coat one more time with the butter spray. Cool completely. Store in a plastic or plastic container. 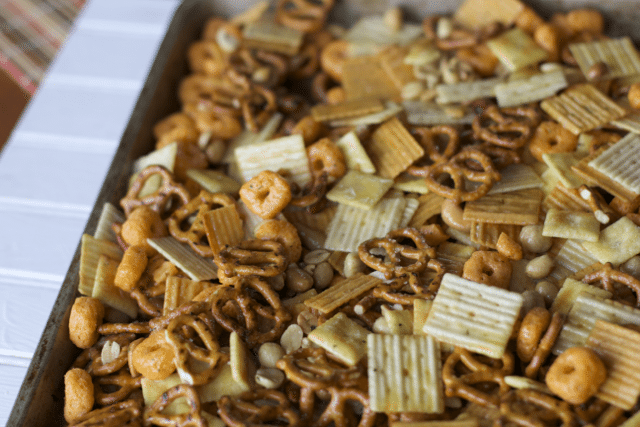 What would you add to this Snack Mix Recipe Combo? Don’t forget to enter Most Valuable Cheese Contest that is taking place from Feb – April 2015. 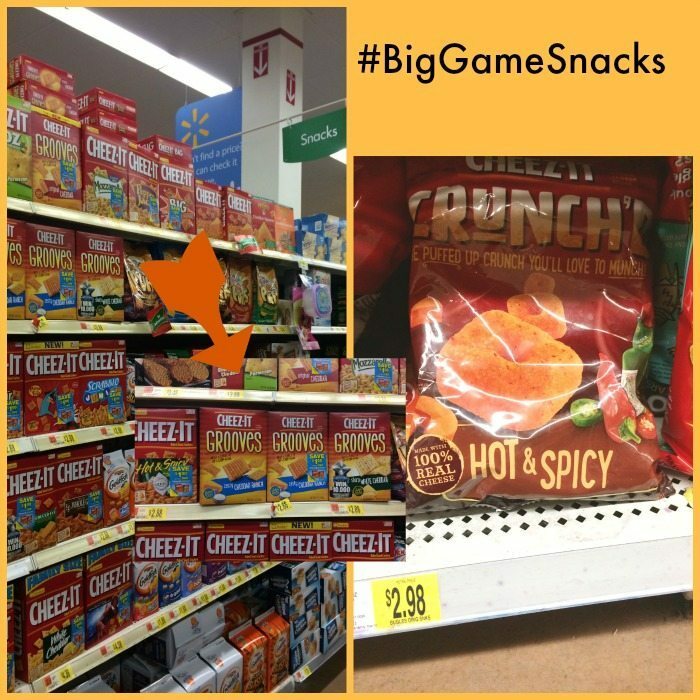 Users can vote on their favorite flavors/varieties from six popular Cheez-It flavors and play games for a chance to win $10,000. I love snack mixes — this one sounds so good! This sounds like a fun and tasty snack option! Yum! That does look real easy. Awesome snack anytime. I didn’t realize Cheez it had such a big selection/variety of items! We’ve used the original for school lunches though and the kids love ’em. Oh my kids would totally gobble this down. So easy to make too. Thank you. That looks delicious! I could use a bowl full right now! Snack mixes like this are such a weakness for me. And I don’t like to share! That way, I can go through and eat all my favorites first, then work my way down the line. 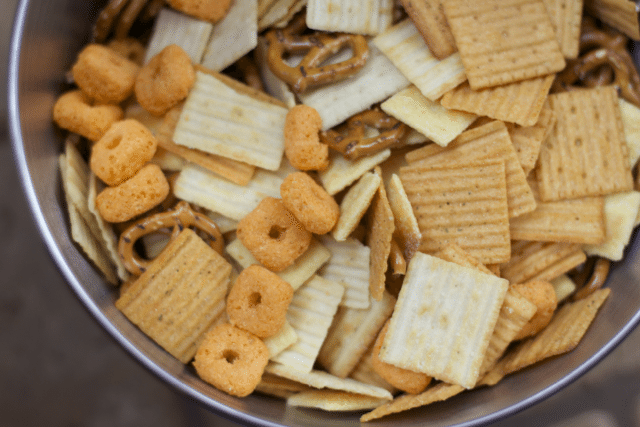 Snack mixes are fun- especially for parties and get togethers! Love this slam dunk snack mix! So perfect for game day! I would love for you to share this over at my new link party Making Memories Mondays going on now! I love snack mixes like this. I might have to add extra pretzels. They’re my favorite! My kids love just about anything that uses ranch dressing mix. They would be all over this. I might have to make this recipe this weekend. I’m all for a good snack mix. Plus Ranch flavor hooler. Oh, I have not spotted those Cheez its yet! Sounds yummy! We love snacking on stuff like this at our house. This sounds awesome. What a great recipe! Crunch!! !